Mark McLellan (gentleman, scholar and acrobat) muses out loud. Reigate, Surrey, UK. Sunday 16-December-12. As every year for decades past the McLellan / Hutchinson tribe gather for the annual pre-Christmas potlatch (exchange of presents). This year at Jane and Pete's in Reigate. Keeping it simple - cream tea including a discussion about the relative merits of jam or cream first. We took a 5 L can of our 2012 olive oil and refilled everyone's bottles from last year that we asked them to save and recycle. The oil was a lovely dark green colour with floaters as it is unfiltered. Believe it or not the bottles cost more than the oil. 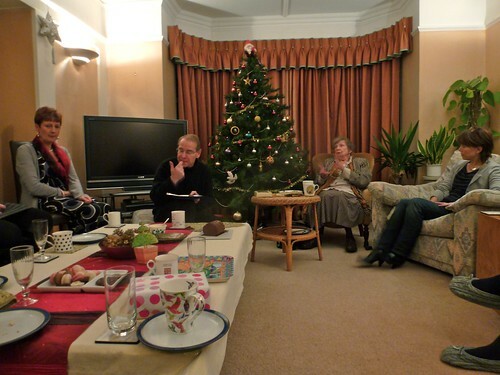 Presents duly exchanged and tea consumed we returned home for a quiet, relaxing evening in.